To view presentations, scroll down to AGENDA and click on presenters highlighted names. Our 2019 conference gathered 300 people from 2 states, 30 businesses, 30 nonprofits, 35 schools & colleges, and 60 Massachusetts communities. How did the conference benefit you? I’m already looking at the layout of my town differently, as well as the ways my neighbors and I utilize our resources and spaces. I am about to begin managing a farm at a boarding school, and I also got a lot of ideas about ways to make the farm sustainable, not only in light of environmental justice, but also sustainable for the emotional and physical well being of the school and neighboring community. The conference was an excellent venue for sharing ideas. I came out with several ideas that I plan to research further in the hopes of implementing them in our community. I really enjoyed learning more about the political initiatives that exist within my community and the progress that so many are making to ensure a sustainable life. I met a lot of new people and widened my network. It gave me a better understanding of what my career path could be. I work for a small community in Central Mass, and I will be able to take ideas being presented in the larger eastern communities and scale them to meet our needs and goals. Bob O’Connor was hugely inspiring. I am planning to partake in as many local tree-planting events as possible after having heard about his efforts and progress. I got insight and inspiration from what others are doing. Not sure what changes will ultimately result, but I will be passing on information and strategies that help make decisions. I learned a lot of new information about what other towns are doing. Since I work in municipal government I will start to bring some of those ideas into my work. The most useful session to me was the municipal one with the Town Administrator from Arlington. Made some good professional connections. I learned about the Good News Network from someone – it has some great sustainability stories. I brought six third graders and they were very empowered! 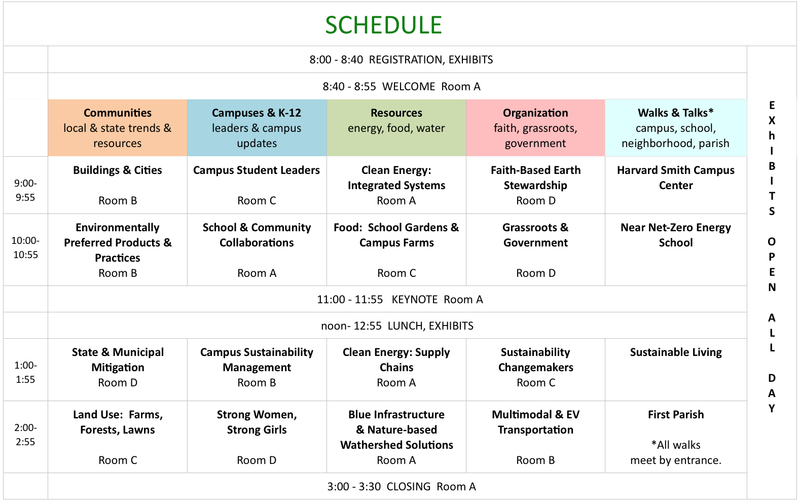 This conference helped me to better serve the campus I work for by gaining inspiration for ways to make URI more sustainable. I was a teacher bringing students who are relatively sheltered. The experience changed them and they are more engaged in general. I am rethinking our school garden (again) and our outing club opportunities. It raised my awareness about going green and the environment. I learned a lot about the topics talked about. I’ll approach the idea of using solar panels. The conference benefitted me because we learned about nature. I learned a lot about being outside and what we are supposed to do. Good connections and ideas for my school garden and sustainable class. Energizing and diverse presenters – appreciated the spectrum of approaches presented on sustainability from faith based perspectives, to farmers, teachers, and scientists, and activists. Presenters also did well to make their subject matter accessible – as someone without a background in policy, science or urban planning, I found the presentations on these subjects to be very clear and inviting. Not to mention energizing and practical. I liked the diversity of the presenters and the wide spectrum of topics. It covered a wide variety of topics. Also, I loved the energy and passion everyone had. I will advocate for aggregate energy programs! I do a LOT in the recycling world, but appreciated the fact that there were several different topics (TURA, energy, etc) that I didn’t know about and could learn from. I can make more informed decisions about products I use and how to dispose of them properly. It gave me some great ideas regarding public education and outreach as well as some thoughts on sustainability initiatives for the town. I found a lot of great resources for energy saving initiatives that I’ll be sharing with my home-owning friends and I feel much better informed about what policies are working and how to advocate for them effectively in other communities. Liked hearing from local mayors & town manager about current and future plans. Good variety of topics, receptive and interactive presenters. I was really impressed with the undergraduate student presenters. Carbon offset for annual conference travel and building energy is a donation to a local organization. This year’s donation will be to NOFA/Mass to support organic food and land care practices. The $35-$80 registration fee covers keynote presentation, breakout sessions, exhibitors, breakfast snack, lunch, and networking. Click on presenters’ highlighted names to view PowerPoint presentations. Learn about leading efforts in solar roofs, better building efficiencies, net zero energy communities, green electricity aggregation and more at the municipal level. Hear from student-project, environmental-club, and sustainability-organization leaders about interests, activities, achievements, and plans. Learn about communities working with utilities, utility transmission restrictions and local microgrid solutions to make local energy systems resilient, envisioning a new utility business model, integrating building and transportation energy systems, and large scale solar farm and rooftop solar trends. Transforming faith into action for communities and ecology is a calling heard by all religions. Learn about progress and plans. Learn about the many sustainability features of this new one-block building with spaces that offer social, cultural, and intellectual activities. The walk is .2 miles (5 minutes) from First Parish one way. Limited to 20 people. Hear from pioneers about toxic reduction strategies and educating the next generation of environmental champions. Learn about initiatives, legislation, and cost effective purchasing choices for public health and the environment that reduce waste, noise, and toxics in our communities and on our campuses. Learn about exceptional models: 1) Third-grader beach-stewards and shoreline-scientists led community action to ban single-use plastics. 2) A Sustainathon campus/community event included organic agriculture, biodiversity, water conservation, food justice, urban forestry, wildlife conservation, city sustainability, renewable energy, sustainable buildings, and waste/water recycling. 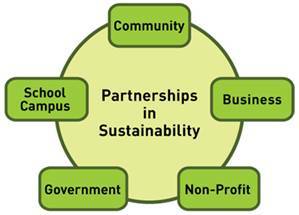 3) Green Ribbon School awards that honor environmental successes at schools. The growing school garden and campus farm movement lays the groundwork for better educated students and more sustainable food choices. Grassroots groups are the foundation of our democracy. Learn about the inspiring work of organizations – their missions, achievements/impacts, and goals. Walk to a middle school in Cambridge to learn about energy and sustainability features. This LEED Platinum, near net-zero school, is the second highest scoring new LEED-for-Schools project in the nation. The walk is .75 miles (15 minutes) one way. The tour will be outdoors only, not indoors. Wear walking shoes and dress for the weather. Limited to 20 people. Hear from extraordinary leaders about achievements and future plans. Learn how the state is helping communities to identify and mitigate potential hazards from facilities with chemical/toxic/waste storage near flood-prone or storm-vulnerable areas. Hear how Salem is becoming a sustainable and resilient city for the future. Sustainability managers present on innovative programs, progress, and plans for their campuses. The process of integrating clean energy into community energy systems requires understanding regional supply chains, aggregation, grid modernization and carbon pricing legislation, a regional cooperative, and local resources available to make a clean energy infrastructure. Understanding what needs to happen to make our future more sustainable goes to the heart of sustainability – food, buildings & energy. More than half our population lives in cities where work, school, shopping, and recreation are nearby. Take a walk in one of the most highly rated communities for sustainability in the nation. Limited to 20 people. Forests, farms, and lawns are common ecosystems found in our communities. Learn about healthy soils and policy work. Also check out planning processes that chart a more sustainable future for land use in communities concerned with development. Hear from organizations creating opportunities for girls to learn and women to lead. Emerging technologies provide cost effective alternatives to traditional, gray infrastructure. Co-benefits include the creation of local jobs, the preservation of real estate values, and habitat enhancement. Hear about a nationally-recognized watershed planning project on Cape Cod. Also learn about Merrimack watershed’s history, modern challenges and local solutions. EV and biking infrastructure is on the rise in communities. Learn about the infrastructure and resources. Tour this historic 1833 meeting house with the office administrator or Environmental Justice representative to learn about sustainability features and initiatives. Limited to 20 people. After brief closing remarks, engage in a discussion and activity to round out the day.